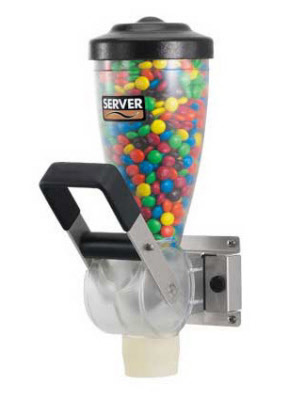 Quickly dispense measured portions of powders and other dry products with a Server Products Dry Product Dispenser. You don't have to be in the food service industry long to know portion control has a two-fold benefit: a consistent product for your customer and a cost savings for you; by eliminating over sized portions. The Dry Dispenser dispenses accurate portions from ¼-2-ounces (7 - 60 mL) by volume. It is adjustable in 1/8-ounce (3.4 mL) increments giving you 15 portion sizes to choose from. You will not find another dry product dispenser on the market today that can provide this level of portion adjustment or accuracy. Dry product dispensers are designed to be mounted side by side for a station of several products. Choose from 1 or 2-Liter capacity models with a single, double or triple wall bracket. A double top stand will accomodate the double models nicely.